We recommend cleaning your data center facility at least once per year, and we can help you set up a program to keep your data center clean. You would never live in a room this dirty, so why work in one? Having a clean environment is one of the most overlooked areas in data centers. While the raised floor may be swept often, there is much more to your data center than that. 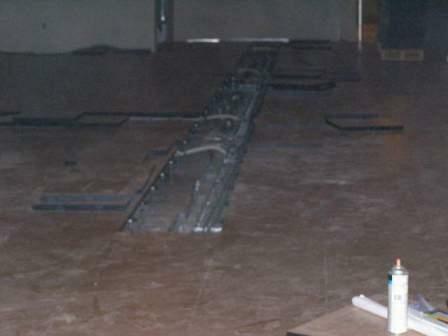 Wires, pipes and cables are left under the floor, abandoned. Dust collects under raised floors, beneath server cabinets, and around pipe supports and cable ties. Contractors and Vendors Bring in Dirt and Dust, Damaging your IT Equipment! Mineral Deposts are Killing Your Servers! Minerals such as magnesium and calcium, found in most water sources, become airborne from outside air sources and humidifiers in your cooling equipment. These airborne particles deposit on your equipment--servers, UPS, switches, everything. Not only that, they are deposited inside your IT gear. A buildup of Mineral Deposts (White Dust) Shortens the life of your servers by up to %30. We do a lot more than just vacuum your floor! We clean and improve your entire data center. We find ways to reduce white dust from killing your servers! Contact us today to learn more about our data center cleaning services and for pricing!